An intarsia is a decorative wood mosaic. The intarsia at our Wilsonville Library is thought to be the world’s largest! There’s an interesting story behind it, too. The Wilsonville Library notes their intarsia is called “Wilsonville Circa 1910.” Measuring 17 feet long by 8 feet wide, it contains more than 5,000 pieces of wood. No paint or stain was used—the colors seen are the actual hues of the 57 different wood varieties from around the world that were used in the creation of this masterpiece. The intarsia was modeled on a sketch by local artist Barbara Sutton, who in turn used historic photographs of the area. The transformation of the sketch to finished artwork was accomplished by a group of 10 artisans who worked on it for a full year. from November, 2002 to October 2003. These talented woodworkers were all a part of a vocational program at the Oregon State Correctional Institution in Salem, Oregon. There is a small display near the Director’s office detailing the intarsia’s construction and installation. The intarsia was commissioned and purchased by the Wilsonville Public Library Foundation entirely without the use of public funding. Just Listed: Affordable Wilsonville One-Level! How Much Does It Cost To Sell A Wilsonville Home? 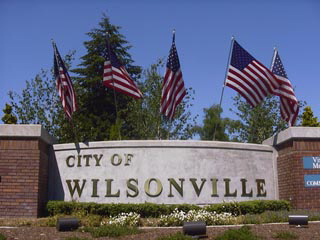 Can I Trust My Wilsonville Realtor?